Young Syrian refugees study a map of the United States at the International Organization for Migration (IOM) Amman, Jordan, office. The International Organization for Migration (IOM) has helped resettle more than 10,000 Syrian refugees to the United States during the year ending 30 September, without compromising the integrity and security of the processing mechanism. As of 29 August, 10,172 Syrian refugees were admitted in the United States as part of the Obama administration’s promise to increase the number of Syrian refugee admissions by 30 September, according to a news release issued by the IOM. 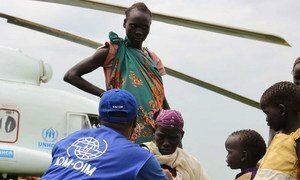 In July this year, the United Nations General Assembly unanimously adopted a resolution approving an agreement to make the IOM part of the UN system as a related organization. The US’ achievement came weeks prior to the UN Summit on Addressing Large Movements of Refugees and Migrants at UN Headquarters on 19 September – at which UN Secretary-General Ban Ki-moon and IOM Director General William L. Swing will sign the aforementioned agreement – as well as a summit on the global refugee crisis, hosted by US President Barack Obama during the high-level segment of the 71st session of the UN General Assembly on 20 September. The majority, or 87 per cent, of Syrians resettled in the US during fiscal 2016 were processed by the IOM’s Resettlement Support Center MENA (RSC MENA) based in Amman, Jordan. “This fiscal year, RSC MENA was faced with a challenge to dramatically increase our processing capacity without jeopardizing program integrity and security. Today, I feel proud of the great team work which led to reaching this important target of at least 10,000 Syrian refugee arrivals in the US,” said IOM’s RSC MENA Project Manager, Jeanette Camarillo, in the release.